Wow... I haven't blogged since the end of July. I could give a bunch of excuses, but I'll just give it to you straight. 1.Working out almost every night and don't get home until like 8:30 . 2. My best friend had a beautiful baby girl in June & I spend all of my free time with her . 3. I have been revamping and really focusing in school this year. I ran across Teaching My Friends! 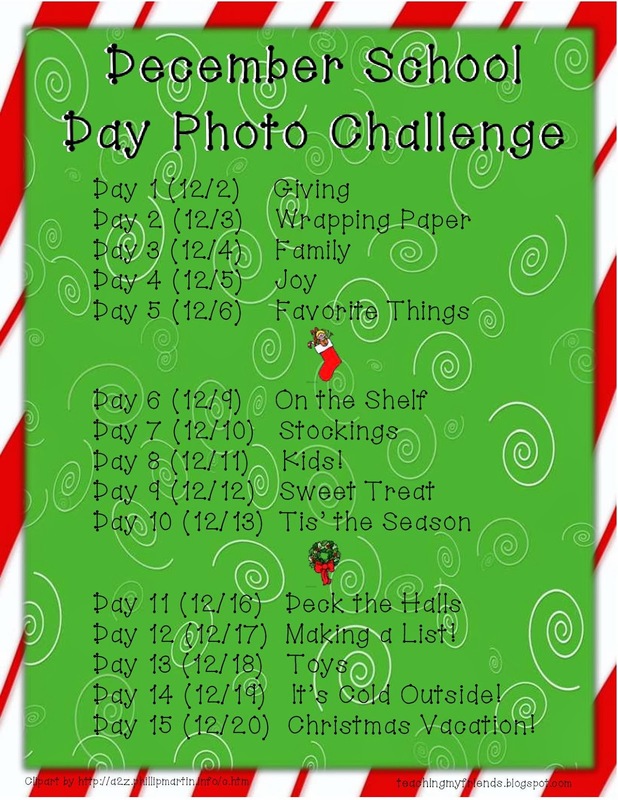 blog and saw that she was going to be doing a photo a day challenge for the month of December. I am going to try and see if I can keep up with it. Head on over to check it out. Here is a preview! Also, I have decided to just back on the currently bandwagon with my girl Farley. Listening... I don't know anyone from the south that doesn't automatically turn their tv to football on Saturdays & Sundays. My Houston Texans aren't doing so hot, but I still watch every single game. Loving... I have my basket stocked and ready for the TPT Cyber Monday Sale Tomorrow. I can't wait to get my hands on some the products! Thinking... My trainer is out of town until Tuesday night, so I am trying to come up with workouts to do Mon & Tues night. If anyone has any that they want to share please send them my way. Wanting... A few more days added to my Thanksgiving break. I just need like another day or so... who agrees?? Needing... The school librarian gave me a book to read for the Junior High to make sure it was appropriate... I am almost done. Favorite Tradition... I love driving around and looking at Christmas lights. What can I say... I'm a child at heart! Hope everyone has an amazing Sunday night... 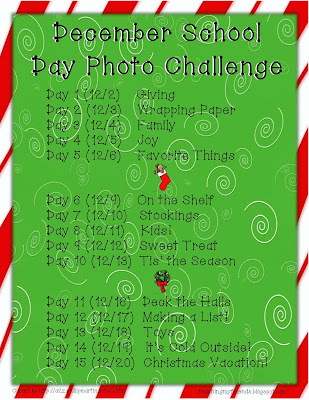 I hope to be back tomorrow to participate in the photo a day challenge with Teaching My Friends! 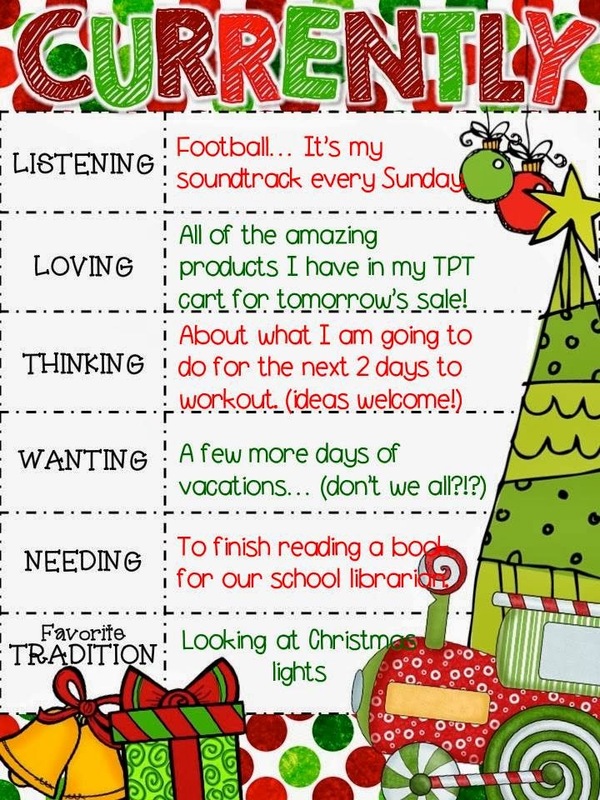 PS- MY TPT STORE WILL BE ON SALE MON & TUES. There you are! I have been missing your posts. Glad to see you back in the swing! Working out....I love Jillian Michaels, and her stuff does work! Try it! I remember driving our kids around to look at lights-- fun memories! I wish I had time in my day to add daily workouts! I am excited when a friend of mine and I can walk at least two nights a week. It is starting to get cold out though, so we'll see if we keep it up! What are you reading!? I love reading young adult fiction!! I hope that you find some awesome houses to check out too!! I found your blog on Farley's Currently linky! I too, have just returned from some blogging down-time! Glad you're back! :-) I'm your newest follower!